A Pictorial Catalog of Papal Medals 1417-1940 as Struck by the Mint of Rome for the Vatican. 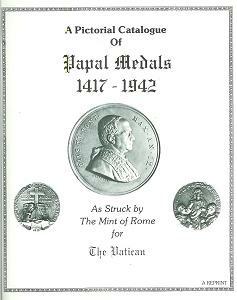 135-page softcover picturing all the papal medals in the Mint of Rome's possession, through 1940. Each black-and-white picture is referenced by its Mazio number. A reprint of the papal medal section of the Italian Mint's 1942 book Relazione della Reale Zecca.